Today's challenge is to follow and promote the #forDeeds hashtag on twitter. Let's flood twitter today with tweets and retweets of the ongoing fundraising effort for Deeds in his quest to get his autism service dog. Bobbie tweeted that they have gotten just past the halfway mark for this last $6000. Please help to raise this final bit. It doesn't matter if donations come in amounts as low as $1. Even $1 donations are powerful when hundreds of people offer it. You can track fundraising progress, read about how Deeds' burns are healing, see darling pics, read the story behind the fundraising efforts, click a link to learn about 4 Paws for Ability, and donate on their official website, Dog 4 Deeds . You can also find updates, pictures, other articles about Deeds and his family, and join in discussions on facebook , and get real time updates from his parents by following the #forDeeds hashtag or following them by username on twitter. 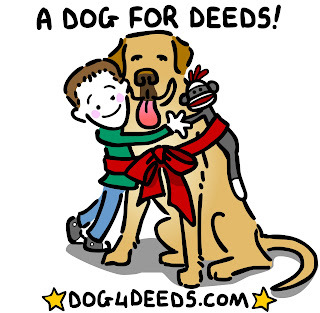 As always, if you feel inclined to do so, please blog for Deeds on Mondays, and paste a link on the facebook wall of A Dog 4 Deeds. The whole family loves to see all the people who care about them. Under $2000 left to go... so close! wahooo! !